This Metal Daisy Stool Set can be used as a seat, plant stand or side table.It is powder-coated finished, allows you to use it in and outdoors. Non-marring feet provide floor protection and is stackable for efficient storage! 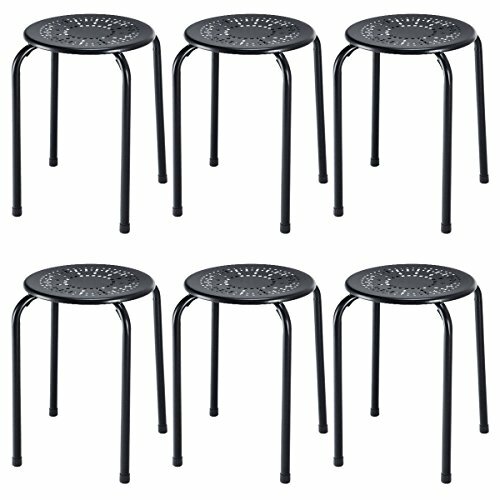 【Unique Design】These beautiful Daisy-patterned stools are multifunctional for seating, as plant stands, a side table, even outdoors. And they are also perfect for family reunion, party or other events. 【Non-Marking】Each leg has non-marking feet caps that won't make scratches to your wood floor. 【Space Saving】Their compact size and stackable design can help you save much space for storage, especially for events, party or commercial use. 【Easy Handling】This high quality stool is very easy to clean, you can just wipe it using dish washing agent and a damp cloth. If you have any questions about this product by COSTWAY, contact us by completing and submitting the form below. If you are looking for a specif part number, please include it with your message.